Excerpt:..."At the present age the same fight between two rival parties of politicians without any guidance of the transcendental direction of Godhead is merrily going on at the expense of the innocent poor people of the world and as such Sree Krishna has descended again in the shape of Geeta Nagari with the same purposes of saving the faithful and annihilating the unbelievers as He did in the battlefield of Kurukshetra." Prabhupada: This is our duty, to keep the cows happy. Just like I want to see my wife and children happy, similarly, it is the duty of the human society to see that the cows feeling very happy. 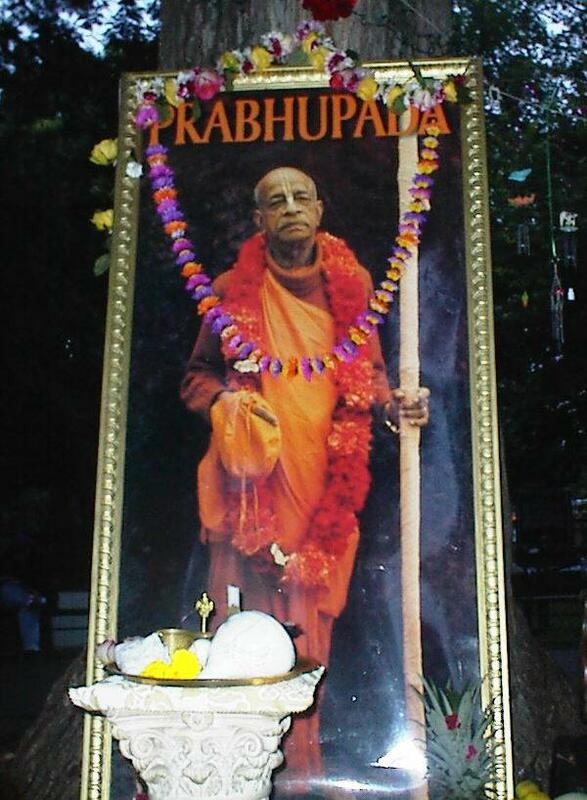 Prabhupada: In Allahabad I was keeping cow, there was facility. Prabhupada: In this way make it ever green. Bhagavan: There was a question about the cows, that at what point should the calf be separated from the mother. Because sometimes when the calf is separated, the mother, she cries. Prabhupada: No, they should not be taken away. Hari-sauri: I think in all our farms they do that. Bhagavan: I heard in New Vrindaban they took them away very early. Hari-sauri: The problem is that the calves drink so much milk that they become very sick, so they have to separate. Prabhupada: Therefore they should not be allowed always. Once in a day, that's all. Prabhupada: Not too much allowed, but once. At least while milking they should be allowed to drink little milk, and that will encourage the mother to deliver more milk. Hari-sauri: Oh. At the same time they're milking the cow, the calf can come. Prabhupada: Yes. They can bring it milk. And while milking, the calf may be standing before the mother. Hari-sauri: They do that in India. Prabhupada: So she will not be sorry. Completely separation is not good. And after birth at least for one week the calf should be allowed. Because after this giving birth the milk is not fit for human consumption. The calf should not be allowed to eat more, but at the same time the mother must see once, twice, then it will be all right. Of course, we are born in big, big towns, we do not know, but I know this is the process. In Allahabad I was keeping cow, there was facility. Mundane votes have no jurisdiction to elect a Vaisnava acarya. Madhya Lila chapter 1 verse 220........................................Mundane votes have no jurisdiction to elect a Vaisnava acarya. A Vaisnava acarya is self-effulgent, and there is no need for any court judgment. A false acarya may try to override a Vaisnava by a high-court decision, but Bhaktivinoda Thakura says that he is nothing but a disciple of Kali-yuga. In Vedic culture, the welfare of the cows and the welfare of the brahmanas are essential. Without a proper arrangement for developing brahminical culture and protecting cows, all the affairs of administration will go to hell. (Srila Prabhupada) "Milk is compared to nectar, which one can drink to become immortal." Milk is compared to nectar, which one can drink to become immortal. Of course, simply drinking milk will not make one immortal, but it can increase the ... one's life. In modern civilization, men do not think milk to be important, and therefore they do not live very long. Although in this age men can live up to one hundred years, their duration of life is reduced because they do not drink large quantities of milk. This is a sign of Kali-yuga. In Kali-yuga, instead of drinking milk, people prefer to slaughter an animal and eat its flesh. The Supreme Personality ... raksya, which means cow protection. The cow should be protected, milk should be drawn from the cows, and this milk should be prepared in various ways. One should take ample milk, and thus one can prolong one's life, develop his ... the favor of the Supreme Personality of Godhead. As it is essential to get food grains and water by digging the earth, it is also essential to give protection to the cows and take nectarean milk from their milk bags. (Srila Prabhupada) "We are advocating cow protection and encouraging people to drink more milk and eat palatable preparations made of milk,................"
We are advocating cow protection and encouraging people to drink more milk and eat palatable preparations made of milk, but the demons, just to protest such proposals, are claiming that they are advanced in scientific knowledge, as described here by the words svadhyaya-sruta-sampannah. They say that according to their scientific way, they have discovered that milk is dangerous and that the beef obtained by killing cows is very nutritious. This difference of opinion will always continue. Indeed, it has existed since days of yore. Millions of years ago, there was the same competition. The demons, as a result of their so-called Vedic study, preferred to hold the side of the snake near the mouth. The Supreme Personality of Godhead thought it wise to catch hold of the dangerous part of the snake and allow the demons to hold the tail, which was not dangerous, but because of a competitive desire, the demons thought it wise to hold the snake near the mouth. If the demigods were going to drink poison, the demons would resolve, "Why should we not share the poison and die gloriously by drinking it?"